Award-winning La Jolla vegan restaurant serving organic, raw & gluten-free food, smoothies, cold-pressed juice & vegan catering in San Diego! 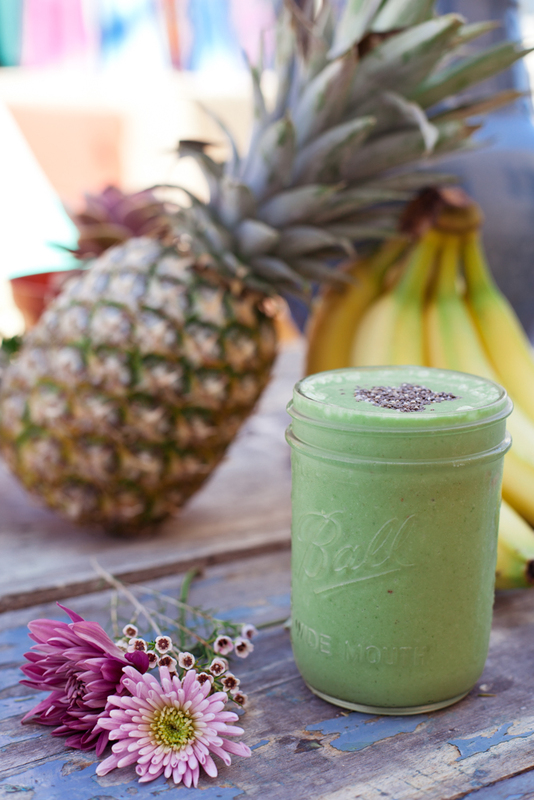 Enjoy a refreshing smoothie or meal after any yoga class - open for brunch, lunch, dinner, drinks & dessert! We also do catering for on-site and take-out for specials occasions - view full catering menu! Note - all prices and items are subject to change due seasonal . Coconut water, cucumber, spinach, pineapple, celery, parsley, mint, avocado, aloe vera. Almond milk, strawberries, raspberries, blueberries, walnuts, dates, activated charcoal. Coconut water, pineapple, mango, avocado, turmeric, topped with chia seeds. Blended with almond milk, cacoa, banana and strawberry. Topped with peanut butter, cacoa nibs, granola, banana. Blended with almond milk, blueberry, banana, goji berries, spinach and coconut butter. Topped with hemp seeds, chia seeds, almonds, coconut flakes, strawberries, banana. Blended with coconut water, banana, blueberry, apple. Topped with granola, banana, strawberries. Blended with almond milk, banana, blueberries, a hint of ginger. Topped with granola, coconut flakes, banana, strawberries. Blended with avocado, blueberries, vanilla, trilogy protein powder, stevia. Topped with nuts, hemp seeds, and coconut flakes. These are the yummiest nacho’s you will ever try! Organic blue corn chips covered in quinoa chili, cashew cheezy sauce, cashew sour cream with pico, hemp seeds & avocado. Two soft yellow corn rolled tacos filled with cremini mushrooms “carne”, garlic fries, guacamole, black beans, corn, lettuce, and sour cream. Served with blue corn chips and pico de gallo. Mango mint quinoa & cucumber slices wrapped in brown rice paper, gently seared with the best peanut sauce in this world. Topped with hemp seeds & shredded carrots. Comes with a side of peanut sauce. Tasty florets of cauliflower grilled in our savory buffalo sauce, served with fresh carrot & celery sticks, a sprinkle of garlic kale chips & a side of herb cashew pine nut ranch dip. A sumptuous cauliflower flatbread, layered with pesto, portobello mushrooms, roasted red peppers, eggplant bacon, hemp seeds and a sprinkle of superfood parmesan. Fresh spring greens, spinach, kale, chopped cucumber, grated beets & carrots. Topped with avocado & eggplant bacon bits. Tossed in smokey tomato dressing. 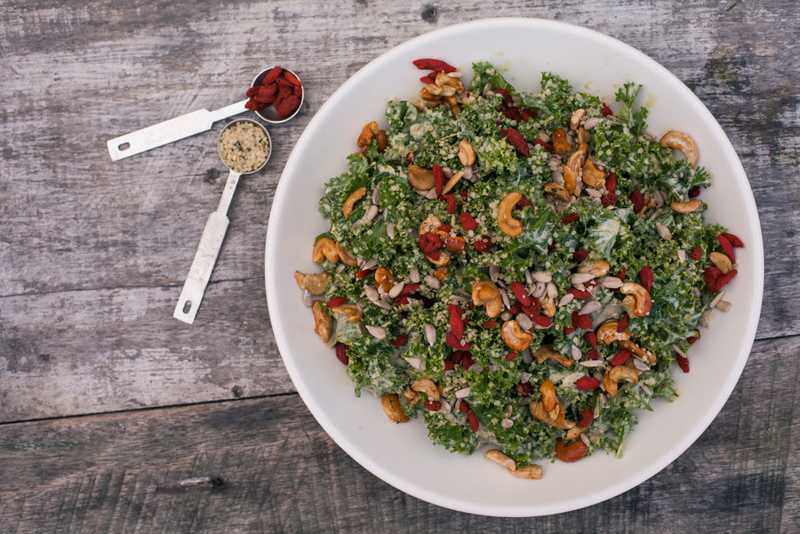 Chopped kale, purple cabbage and celery with a sprinkle of sunflower seeds, and maca spiced walnuts. Tossed in a creamy turmeric dressing. Spinach, steamed and cooled quinoa, garbanzo beans, shredded carrot, and cucumber with a ginger miso dressing. Our raw coconut wrap bursting with sage hummus, roasted butternut squash, avocado, caramelized onions, rosemary, spinach, red cabbage and kale chips, with a drizzle of lemon tahini dressing. Raw coconut wrap filled with avocado, kale, peppers, beet and red cabbage sauerkraut and coconut yoghurt tzatziki, with a healthy drizzle of basil, pine nut pesto. Two of our house-made red corn tortillas filled with homemade quinrizo, avocado, eggplant bacon, pico & mildly spicy almond love sauce. When we say perfect, we mean it. Served with a side salad. Grilled falafel bites served in our homemade buckwheat pita with olive tapenade, chopped spinach, chopped garlic tomatoes & lemon tahini dressing. Served with a side salad. Our buffalo cauliflower, tucked into our house made corn tortilla. Topped with crisp purple cabbage, shredded carrots and kale chips with dollop of probiotic rich coconut yogurt tzatziki. Buckwheat crepe with eggplant bacon, crisp romaine lettuce, heirloom tomatoes & avocado with our sun-dried tomato cashew aioli & sunflower sprouts. Served with a side salad. A tasty vegan burger made with brown rice, bean & portobello mushroom grilled with cashew cheeze. Topped with fresh tomato, lettuce & caramelized onions. Comes with a side of sun-dried tomato cashew aioli & sweet potato wedges. Served on warm buckwheat pita. Option for crisp lettuce wrap. Our mouth watering patty made from beets, black beans, quinoa, and roasted red peppers grilled with cheeze served in a toasted burger bun. Topped with spinach, tomatoes, and caramelized onions. Served with garlic fries. Delicious garlic roasted portobello mushrooms in rolls of roasted eggplant. Grilled with cashew cheeze & served over creamy maple mashed yams, broccolini topped with hemp seeds & our pine nut pesto. Warm roasted spaghetti squash with our tasty fennel marinara sauce. Topped with meatballs, chopped garlic tomatoes & a sprinkle of superfood parmesan. White corn tortillas filled with portobello mushroom sautéed onions & red bell pepper over brown rice. Covered in pumpkin seed mole topped with pumpkin seeds, cashew sour cream, pico, hemp seeds, avocado & sunflower sprouts. Brown rice elbow macaroni smothered in our rosemary cashew cheeze sauce. Baked and served in a cast iron skillet topped with pesto and eggplant bacon. OMG. Tasty garlic portobello & cauliflower cashew ricotta raviolis served over a white bean ragu & chopped garlic tomatoes with a good drizzle of pine nut pesto & a sprinkle of kale chips. Quinoa steamed with onion, carrot & celery, sautéed with kale, butternut squash & broccolini. Topped with your choice: almond love sauce and cashew sour cream OR peanut sauce. A colorful bowl of steamed brown rice, roasted red peppers, roasted sweet potato, black beans, corn, caramelized onions, steamed red cabbage, avocado and pepitas, served with a healthy drizzle of chimichurri sauce. Mango mint quinoa over mixed greens with turmeric hummus, cucumber, roasted red peppers & avocado. Served with a warm buckwheat pita, pine nut pesto & a drizzle of lemon tahini dressing. Broccolini, kale & spinach over steamed brown rice topped with avocado, coconut cashews & sunflower sprouts served with coconut aminos. Ginger garbanzo bean miso sauce served with roasted peppers, broccolini, cabbage, spinach and fresh basil. Topped with cilantro and coconut amino cashews. Spiced red and green lentil dahl over brown rice with probiotic rich coconut yoghurt tzatziki with beet and red cabbage saukaraut and fresh cilantro. Macrobiotic, probiotic. This amazing brownie is rich, moist and chocolatey. Served warm with a gloriously creamy coconut ice cream & salted walnut date caramel sauce. Buckwheat crepe filled with delicious homemade nutella and sliced banana drizzled with salted walnut date caramel sauce. Topped with vanilla cashew cream and chopped hazelnuts. Good to share! 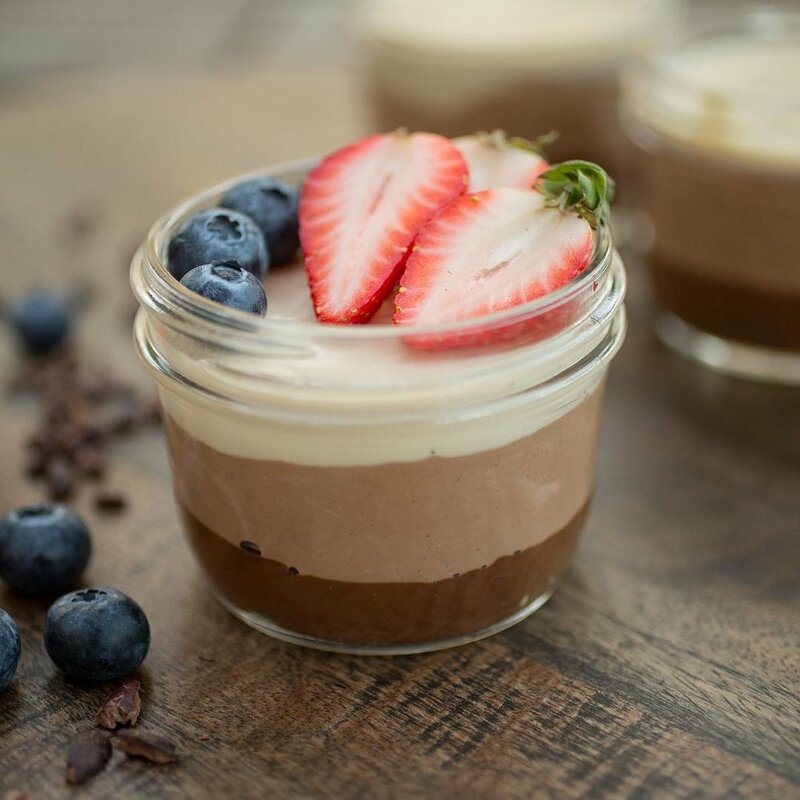 Dark chocolate mousse layered with creamy chocolate mousse and enticing vanilla cream topped with fresh strawberries and raw cacao nibs. Amazing raw carrot cake, with hints of cinnamon, spices, and nuts with a thick and creamy lemon vanilla topping. Choose two of today's yummy cookies and have our amazing creamy vanilla coconut ice cream sandwiched between them. Topped with crunchy raw cacao nibs! Blue green algae…boots immune, balances brain, magic! Open faced toasted amaranth and millet muffin with avocado and tomato. Topped with our very own cauliflower eggs and hollandaise sauce. Make it a popeye! With wilted spinach instead of the muffin. Latin style eggz on handmade corn tortillas, pumpkin seed mole, avocado, pico, and sour cream. Served over fiesta rice. Our quinoa 'chorizo' with cauliflower eggz. Served with pico, avocado, sour cream, warm corn tortillas, and a side salad. Buckwheat wrap loaded with quinoa chorizo, "eggz", sweet potato hash, cheesy sauce, mushrooms, fresh spinach, sour cream, pesto, and avocado. Gluten free buckwheat crepe filled with sweet potato hash, spinach, cheezy sauce, avocado, heirloom tomato and a hint of hot sauce. Buckwheat crepe filled with our healthy homemade Nutella and sliced banana. Topped with cashew cream and a drizzle of caramel sauce. A trio of pancakes; topped with strawberries, banana, peanut butter, maple syrup, coconut flakes, and cacao nibs. Our gluten free flax and hemp granola with almond milk. Topped with sliced banana. Add two superfoods: hemp seeds, almonds, walnuts, cashews, goji berries, flaxseeds, chia seeds, OR pumpkin seeds. Homemade muffin, fresh fruit, coconut yoghurt, and your choice of coffee or tea. Delicious coconut vanilla chia bowl, served with seasonal fresh fruit toppings. Ask server for today's yummy option.